The recycling, processing and manufacturing of recovered plastic bottles creates jobs for 3,500 people in North Carolina and South Carolina. In North Carolina and South Carolina, the recycling, processing and manufacturing of recovered plastic bottles creates jobs for 3,500 people. And it generates more than $228 million in capital investments, according to the South Carolina Department of Commerce. An additional 300 jobs could be created if each household in the Carolinas recycled two more bottles weekly. “The campaign focus goes beyond an environmental message of saving landfill, energy and other resources. 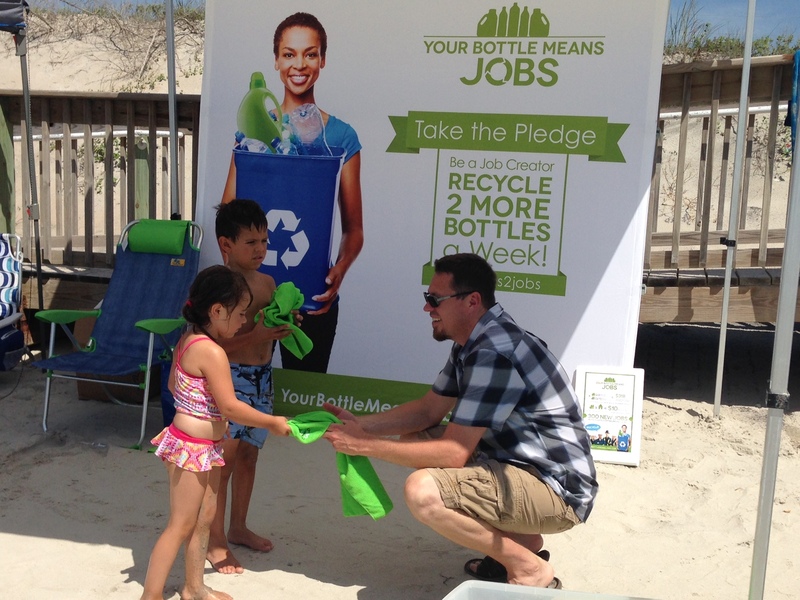 We built an education platform around plastic bottle recycling with an economic development strategy in mind,” says Chantal Fryer, director of recycling market development at the South Carolina Department of Commerce, who was among the campaign’s developers. The Your Bottle Means Jobs logo shows images of the two most recycled bottle types in the Carolinas: those made from high-density polyethylene (HDPE) and from polyethylene terephthalate (PET). The campaign first launched as a pilot in March 2016. As it’s grown, it’s seemed to make a difference. From March 2017 to May 2017, the two states saw a 2 percent increase in recycling of these bottle types. Material recovery facilities (MRFs) report they are selling all their bales, says Fryer. “The message that recycling is good for the Earth has been around since the 70s, but when people hear this, I feel like they glaze over. It’s like, ‘I heard that before; we all know it,’” says Tori Carle, waste reduction supervisor for Greensboro, N.C.
Carle began incorporating Your Bottle Means Jobs into her educational programs in the summer and fall of 2016. She tells the community how the bottles go to a local MRF, and then to a nearby facility to be washed and chopped into flake. She explains the flake is melted into pellets and later comes out of a machine through holes the size of tiny hairs. “Then, I tell people to close their eyes and envision this. I get my visual of yarn that Unifi (an end user of feedstock) gave me, and tell them to open their eyes. I tell them, this is [one of the things] the bottle is turned into. The look of awe on a five-year-old, 15-year-old or 50-year-old’s face is the same—what? That yarn is made from plastic bottles? I show them t-shirts, cleaning cloths and other things made from it,” says Carle. She tells them only 30 percent of the bottles are recycled. And she lets them know how they can make a difference. “I think what’s powerful about this campaign is you can show and tell them. It’s tangible, and they can relate in that it impacts them,” she says. Greensboro made a short video based on a longer one provided by Carolina Plastics Recycling Council and airs it on a local TV station. The council also provided communities with compelling stats. “But the biggest difference of having this campaign available to us is it gave us a fresh message as an education and outreach tool. I now show recycling benefits through an economic lens rather than only an ‘it’s good for the Earth’ lens. It’s something people haven’t heard, and it’s personal,” says Carle. The Sea Pines Resort on Hilton Head Island, S.C., promotes the campaign during the RBC Ventura Heritage, a four-day golf event the resort hosts that draws about 135,000 people. It also presents it at river cleanups and other community events. “Sadly, some people think that recycling is for tree huggers or politicize it. But when you point out the products [and jobs created], you see the lights turn on. People from all walks see the value in providing jobs,” says Tony Wartko, Sea Pines Resort director of facilities services and sustainability. It especially resonates when people hear that the Carolinas ship bottles in from out of state for recycling, while locally tons are landfilled, he says. For recyclers working in a traditionally very competitive industry, the campaign has highlighted the need to work together to increase recycling rates, says Stephen Zagorski, vice president of new business development for USFibers in Trenton, S.C. He, too, punctuates the public awareness piece. “Now, more and more people know, for instance, that polyester makes water bottles and water bottles make fiber for automotive trunks, wheel wells, sound absorbing and undercarriages. They learn it goes in diapers, pillows, mattresses and the list goes on,” he says.